Its been an amazing two weeks with going on holiday and getting a proper restful break where I got to sit on my bum for a good few days. Granted it was looking after Little Z for some of it due to his chicken pox which had the most excellent timing of all popping out at once as soon as we landed, but still. Its been a lovely couple of weeks where we managed to all switch off work and the busy life and just sit about and bond with each other. Our holiday was booked months and months ago and it was our “screw all this waiting about to grow our family, lets go on holiday” holiday. It would have been a holiday where I would have sat about on a lounger and wondered what the future would bring us, whether I was happy in my job, whether I should change my job, whether I should write do something drastic and exciting. It’s something I tend to do on holidays. Ponder and muse about how I could take a bit of a diversion and do “something else”. This time it was a different and slightly surreal feeling. I wasn’t pondering and musing. I knew, hopefully, what the next few months, and indeed year, would bring. I would take a year off work, hopefully have a baby and look after it. All being well we will be a family of four and that’s a very very strange feeling. Of course its lovely but it does feel slightly alien just now when its been “just the 3 of us” for so long. In reaching that 20 week milestone, I cannot believe how fast the pregnancy is flying by. I’ve written about Weeks 19 and 20 here. This pregnancy has been a lot more tiring for all sorts of reasons and some days have felt very long. But it is flying by in a complete blur. Each appointment and scan brings with it a sense of nervousness and a slight apprehension about what news to expect. Thankfully its all been so far so good and I hope it does carry on like that. I still need to make the decision about what kind of birth I would like but I’ve left that until the 36 week mark. That way I am pretty much ignoring any anxious feelings about it and that’s fine by me. So a bit of a rambly post that doesn’t sound like much to many people but I’m pretty thankful for coming this far! Now its your turn. 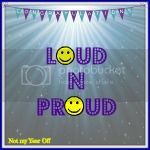 Come link up with any of your little or big loud and proud moments. They can be old or new and about whatever has made you proud and happy of what you’ve achieved. All you need to do is grab the badge, link up below and visit a couple of the other posts if you can! It’s open till Sunday night so you have plenty of time. Next week your friendly host is Suzanne from 3 Children and It. This entry was posted in Toddler and tagged 20 weeks pregnancy, being pregnant, going on holiday, Pregnancy, preparing for new baby, Reaching a milestone. Bookmark the permalink. Pregnancy Diary – Weeks 19 and 20. You’ve come a long way! Being pregnant is a scary time, with so many changes and so much to look forward to and worry about! Sharon Powell recently posted…A night of dance! Wow, 20 weeks already! I think your holiday couldn’t have come at a better time. Glad you had such a great time, and hopefully it’s got you recharged and ready to tackle the next 20 weeks. It will fly by, I’m sure! Louise Fairweather recently posted…Are You A Hoarder? WallyMummy recently posted…Just a Normal Mummy has moved! WallyMummy recently posted…The threenager’s guide to conducting yourself at birthday parties. Sounds like it was good timing having your holiday. Fingers crossed the other half of pregnancy goes well, and can put your mind at rest somewhat.